This is the Original Wooden Guitar Photo Prop. You won't find another Prop like it anywhere it is super unique. Unlike real Guitars my guitar is super sturdy and doesn't tip over. My guitar is wider than real guitars and given a lip on the sides so the baby stays in the middle easier (as shown in photo 2). 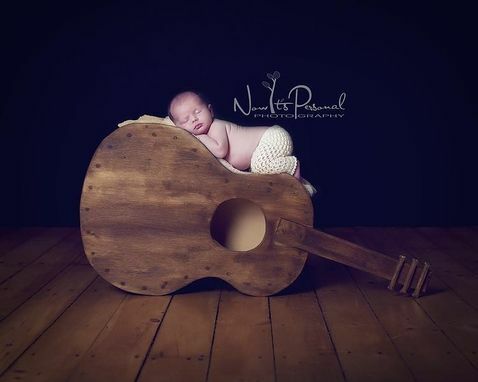 This Prop is a must have for those ROCKIN Newborn, Toddler, and Older Child Photo Sessions. Made of Solid wood this piece is Heavy and really sturdy. The Guitar is stained to give it that real Guitar Look!! I can paint this guitar in any color you would like if you perfer it to be painted instead of the stain. This Guitar Prop comes along with this Rocker Hat. I ship all my products worldwide so if you are out of the US simply send me your full mailing address and I will send you a shipping quote. All my products come fully assembled, painted, and ready to use.